I am in a good mood this week. Let me count the ways. Well first off, any week with a new release from Joanna Newsom is a good one. When that release is Have One On Me, a three disc magnum opus, it’s a great one. It’s like Christmas and I’m just starting to explore all of the music contained therein. And while I’m at it, I was rather pleased to hear the final official details of the Metropolitan Opera's 10/11 season announced on Monday. There are more than a few very interesting things in the proposal including Adams’ Nixon in China, the Willy Decker-directed La Traviata, and the first two installments of the new Ring cycle from Robert LePage. But most of all, it’s exciting to see the country’s biggest opera house produce a season that actually looks like it might have come out of the last two decades. Of course, the substantial conservative elements of the New York opera audience aren't going quietly. Just take a look around the comments areas on Parterre Box if you want to hear the complaints over the lack of appearances by dead singer or obscure Europeans with minor careers. Hands are being wrung over the threat of “Regie clichés” even though lord knows how the average New York opera goer would have been exposed to those in the first place without traveling overseas. My only real complaint is that the best elements of the schedule are so spread out that it makes it difficult to coalesce my interests into a small series of excursions. Other best bets are sure to be Reneé Fleming in Strauss’ Capriccio and the Simon Rattle-led performances of Pelléas et Mélisande. Making music the old fashioned way on the streets of L.A. I love contemporary classical music because you never know exactly what you’re going to find. Sure, there are artistic trends and common methodologies than can be identified and explained, but the sense of discovery in hearing something that is relatively new is always different from the discovery in something well known that has arguably been “made new” again in terms of a specific performance or reiteration. Take the Monday Evening Concert series, which this week presented a program of works by Mauricio Kagel. MEC is no stranger to composers who prefer theatrical approaches to music. This season alone has brought us semi-staged chamber pieces invoking the sands of the desert and piano compositions played with the assistance of stuffed animals. But Monday was a new one for me. 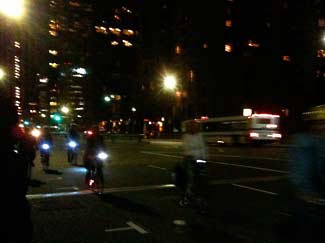 Standing outside in the dark along Grand Avenue downtown awaiting just over 100 bicyclists to whiz by. Entitled Eine Brise, this 90-second work consists of just about that - a large cadre of bicyclists peddling past the audience as the riders shushed and whooshed like the wind. But as odd as it sounds, I have to admit it was a rather thrilling minute. At first there was nothing other than the typical city noise. Then off in the distance one could hear the faintest ringing of bells as some of the cyclists nighttime lights flickered on the horizon. Then they were there, the metaphorical breeze of Kagel’s title passing just as quickly. And much like a breeze, it left you standing there wondering if the experience had taken place at all. The nighttime setting turned out to be perfect for the experience enhancing the mystery around the piece. The rest of the show was very fine, though more predictably indoors. Prior to the outdoor excursion was Kagel’s Dressur, German for animal training. Kagel employs three percussionists who use a remarkable variety of almost entirely wooden instruments from a marimba to coconut husks to wooden straight back chairs. The best moment was undoubtedly the nutcracker accompaniment. The piece featured the second time this month that I’ve seen a percussionist bare his chest in order to play it. Dressur has as much stage direction in it as it does actual music with the players threatening each other with furniture and at one point even enacting a spirited flamenco-style dance on a wooden floor in Dutch wooden shoes topped off with an “Olé”. The work pointedly addresses issues about how audiences think about performance and the work involved in them. It was also a lot of fun. The evening ended with the comparatively straight-forward Trio in Three Movements for piano, cello and violin. Although the work is filled with recognizable melodies common in much less rarefied settings like the circus or carnival, Kagel adds his own layers of depth. He sets the individual parts askew to one another, at times encouraging the players to take their own independent tempos. There was plenty of interesting music in the thirty minutes and proved a nice contrast to the far more staged works in the first half. All in all, another winning evening from the MEC folks. Watching the dreadfully directed production of Verdi's Nabucco, which opened on Saturday in San Diego, makes one yearn for thrills and excitement of the New Testament. Lotfi Mansouri may have done a lot for opera over his long career, but the static and almost inert staging he's thrust upon this cast and their audience made me identify a little too much with the Jews held captive in Babylon - I too lamented to God about longing to be free (of this production) and back in my homeland. I did admire Mansouri's attempt at period authenticity by calling for acting maneuvers common in the Old Testament. There were modern touches here and there, though, like the Babylonian soldier's red stormtrooper costumes and wigs circa the Don Knotts era of Three's Company. Actually, Michael Yeargen's set design, on loan from Lyric Opera of Chicago, wasn't half bad using a minimal blue room with three large sliding archways and video projections for scenery at the rear. It was certainly colorful at times switching easily from bright to dark. Of course, when you have a minimal set and give your cast nothing to do during their time on stage other than sing, the vocal qualities are paramount. And there were at least two performances worth hearing. 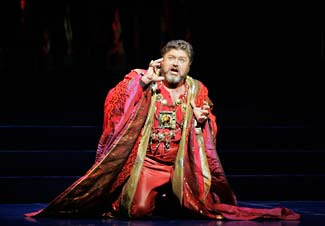 Nabucco was sung by American baritone Richard Paul Fink who replaced the originally announced Željko Lučić. (Lučić is the second major star to back out of a San Diego production this year at the last minute following Anja Harteros who bailed on Mimi in January.) Fink had a much brighter and warmer tone than I've remembered from prior outings but that may be because I so closely associate him with the music of Wagner. He was consistently good throughout and it was great to hear him in a big Italian role. Not to worry though, he'll be back in Los Angeles throughout the spring as Alberich both in Götterdämmerung and throughout the Ring cycles there in June. I was also fond of Raymond Aceto's Zaccaria who was commanding and clear. Sadly these men greatly outperformed virtually everyone else in the cast who ranged from serviceable to painful. Sylvie Valayre sang Abigaille with some agility but not much beauty and there were many pesky tempo problems. But Nabucco is an opera of choruses more than anything else and the chorus did sound fairly good throughout. Oddly, the Va Pensiero in Act III, perhaps the most famous piece of music in the entire opera, was not the strongest number of the evening but it wasn't horrible. The orchestra under Edoardo Müller exerted a significant amount of control, although they could have played out a bit more at times. They were certainly deferential to the soloists. So there are some things to recommend this current revival, but admittedly one has to wade through quite a lot to get there. The February "pageant of the masters" continues this weekend with the Los Angeles Philharmonic who welcomed another legendary conductor, Charles Dutoit, to town. 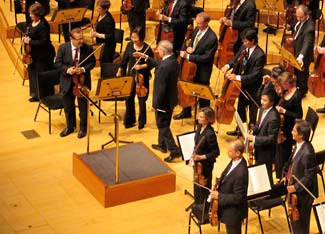 It was a really wonderful program of 20th-century works that incorporate folk elements. The program began with Ginastera’s Variaciones concertantes, an often quiet series of variations built around a latin theme that allows for numerous solo performances from different players. Written in the 50s, Ginastera abstracts the latin influence in his own way, assigning music that traditionally might belong to a guitar to the harp instead, which plays a central role in the work. It was beautifully played by L.A. Phil harpist Lou Anne Neill and was an absolutely lovely way to start. Perhaps the biggest surprise to me though was the performance of Ravel’s Piano Concerto for the Left Hand that followed. The soloist was the young Russian Nicolai Lugansky and he should be credited for taking an overly familiar Romantic concerto and presenting it in a way that sounded like it was a completely different piece of music. It was totally new here with an internal idiosyncratic rhythm free of any histrionic flourishes that can easily creep in. It was the polar opposite of the work-a-day take on Beethoven’s fifth piano concerto Louis Lotrie had delivered just two night before. I did notice that Lugansky repeatedly used his right arm and hand to balance himself against the side of the piano while playing which did seem a little like cheating though I'm sure there's no formal written rule about it. Returning to a work brimming with folk elements, Dutoit then led a very solid version of Stravinsky’s Petrushka. This was also gratefully clear-headed maintaining a lot of the whimsical detail but still swelling with boundless energy and sound. The tinkling carnival music of the opening scene was perfect and the quiet, almost sputtering ending of the performance gave off both a tragic and surreal aura fitting perfectly with the theme. It was a winning night and a very worthwhile performance which you can still catch on Sunday. There’s no irony quite like German irony. It’s that special blend that can bewilder Americans in particular over what appears to be a highly contrasting mix of admiration and a far more arch critique of the subject at hand. Take Max Raabe and the Palast Orchester who returned to Southern California this week including a performance at UCLA’s Royce Hall on Thursday. It was classic Raabe. The dapper and droll bandleader dressed in formal evening wear croons to popular songs of the 1920s and 30s with his similarly period orchestra. The songs couldn’t be more familiar including “Happy Days Are Here Again,” “Dream A Little Dream” and “Falling In Love Again.” They are performed in jazzed up arrangements that are still surprisingly unadorned and simple by contemporary standards. Raabe accompanies everything in a lithesome falsetto. In between numbers his stilted delivery of witty understatements acts as a bridge between songs from Irving Berlin, Cole Porter, and even Kurt Weil. Many of the songs are performed in German emphasizing the cultural perspective of the ensemble. There are flashes of humor and even slapstick in the set which involves 12 other band members and it is all splendidly done. But the point of it all remains tantalizingly elusive. Max Raabe, a character played by the groups leader, is clearly musical and highly educated about the musical period their songs come from. Yet at the same time, the detailed reproduction of costumes and physical gestures and mannerisms implies a larger project. There is more going on here than nostalgia. Yet at the same time, Raabe and his players never break the spell more than to give a glance that tells you there's something more. There is a subtle knowing wink in these songs of romantic love from a culture markedly different from the one we now know. Granted this is a feeling that audiences can decide to love or hate. But it is unquestionably unique and it might just be brilliant as well. I love Max Raabe and his orchestra precisely because there is something decidedly unwholesome about something that on the surface seems just the opposite. The show at UCLA, the third the band has done here, was a highlight of the UCLA performing arts season and it was sad to see it end. The Leipzig Gewandhaus Orchestra makes a point in their press materials of being the oldest civic orchestra in the world. They point to a storied history of legendary music directors and note such fun facts as that the orchestra performed all of Beethoven’s symphonies during the composers lifetime. Now I’m not one to buy into the importance of pedigree in creating an orchestra’s “sound” much less that specific orchestras have particular and readily identifiable “sounds” to begin with. But I must admit that the all Beethoven program the Gewandhaus performed in Los Angeles on Wednesday under the direction of Riccardo Chailly makes me begin to think twice. It was an overly familiar program consisting of the No. 5 Piano Concerto and Symphony No 7. The symphony had been played on this stage as recently as two weeks ago under Herbert Blomstedt (himself a former music director with the Gewandhaus Orchestra). But tonight the Gewandhaus’ performance was clearly on another level altogether. It thrived and breathed at every turn, full or drama and tension one would typically associate with much bigger and later Romantic works. I’m not the world’s biggest Beethoven fan, but I must admit it was mighty impressive and against my better judgment, I caught myself imagining the weight of this orchestra’s history with this music from the beautiful rich sound it produced. If I had any complaint about the evening, it was the nearly always unpleasant intrusion of fate. The originally scheduled soloist, Nelson Freire canceled due to illness. In a pinch, Louis Lotrie was called in for the concerto. He played nimbly and very expressively, but at times a touch of schmaltz put him at a distinct disadvantage against Chailly and this world class orchestra. He was very warmly received by the audience, though, and both soloist and orchestra gave Beethoven encores as well. Chailly introduced the Prometheus Overture, played as the encore in the second half of the program, by noting that you can never have too much Beethoven. While typically I couldn’t disagree more strongly, for just this night and with just this orchestra, I was easily persuaded otherwise. Well, since you asked…I have rather mixed feelings about the 2010-2011 Los Angeles Philharmonic Season that was announced on Tuesday along with the now obligatory microsite and video selections. L.A. Phil President and CEO Deborah Borda apparently traveled to Caracas to film a season preview with music director Gustavo Dudamel that’s included on the site. A friend of mine told me she thinks his English seems to be improving. Let’s hope his conducting is as well, considering the twelve or so programs he’ll be leading in Los Angeles in addition to an international tour in early 2011 with the orchestra. The good news is that the schedule still features a sizable helping of 20th-century and newer music. There are numerous commissions including concertos from Osvaldo Golijov and Peter Lieberson, a new symphony from Henryk Górecki, orchestral works from Thomas Adès, and a setting of The Importance of Being Earnest from Gerald Barry. There’s also music from Anders Hillborg, Magnus Lindberg, Unsuk Chin, Stephen Mackey, Paul Hindemith, Sofia Gubaidulina, and two extra-large portions of Messiaen. Best of all, early April will bring “Aspects of Adès”, two weeks of programming curated by the L.A. Phil’s newest BFF, composer Thomas Adés. In addition to heading up the most promising of the works mentioned above (including Messiaen's Éclairs sur l'au-delà), the composer will reprise his own In Seven Days with video from artist (and his hawty hubbie) Tal Rosner, which graced the WDCH stage last season. There are also a number of high profile guests worth seeing. I won’t want to miss Bryn Terfel in both a solo recital and a program with the orchestra, Pierre Laurent-Aimard, Leila Josefowicz, Jaun Diego Flórez, Christine Schäfer, Mathias Goerne, and Martha Argerich to name a few. But most exciting of all will be the return of Esa-Pekka Salonen in November for two weeks of shows to feature among other things Wagner excerpts with the aforementioned Terfel and a concert version of Bartók’s Duke Bluebeard’s Castle with Anne Sofie von Otter and Willard White. But don’t worry sports fans. Here at Out West Arts, I pride myself in keeping an eye on the half-empty part of the glass as well. Even with newer music popping up in more programs than not, the majority of the heavy lifting in conducting it will be done by folks other than the music director. Perhaps the biggest exception to this gross generalization are the Dudamel-led performances of Messiaen’s Turangalila Symphony. I’m ecstatic that it’s on the schedule, but worry it may not be in ideal hands. Dudamel will also lead at least two of the big commissions (the Golijov violin concerto and the Górecki symphony) in the midst of the rather uninspired sounding “Brahms Unbound” series in May of 2011. As with the previous unbinding of Beethoven a few year back, more Brahms than anyone should have to tolerate will be used to create new music sandwiches with contemporary works stuffed between symphonies, overtures, and the German Requiem. I’ll likely go for the premieres, but I'm not holding my breath on the world being rocked or anything. Otherwise it’s Mahler, Beethoven, Schumann, Bruckner, Mozart, Haydn, Debussy, and a whole evening of Tchaikovsky pieces inspired by Shakespeare. This is an orchestra after all, and that is what they do. So, despite some weaknesses, things could be a whole lot worse. But perhaps my biggest concern is that this season seems like its been assembled by a committee intent on achieving certain goals rather than by a leader with a specific vision or like-minded small group. Tried and true formulas mixing just enough X with enough Y to keep the other camp happy are rolled out again because this is what has worked in the past, and it’s certainly the way the L.A. Phil has built its reputation over the recent years. And that is not at all a bad thing. To be honest I feel guilty complaining since there appears to be a clear effort to maintain much of what I and many others have loved and continue to love about our local orchestra. But somewhere at the core, there’s a heart and a vision that’s missing. In the arguably very similar seasons programmed under Salonen a few years back, you could sense his hand in everything. As much as I hate to lose that, there's a lack here as if things are being kept alive by a committee after Elvis has left the building. Damned if you do and damned if you don't, I'll be renewing my subscription anyway. With all the emphasis on youthful energy and eye twinkle in these parts, it was refreshing to hear the Los Angeles Philharmonic play so well this weekend under the direction of 76 year-old Rafael Frühbeck de Burgos. It wasn’t a revolutionary program by any means, but it was probably one of the best shows they’ve had so far this season. This shouldn’t be a surprise however since Frühbeck de Burgos has proven to be one of the most consistent visiting conductors the Philharmonic has engaged season after season. He manages to evoke such a warm polished performance nearly every time with so little fuss. This weekend was thankfully no exception to this rule and a welcomed reprieve from truckloads of youthful promise that has become the mainstay of our local musical diet. First up was Schumann’s Symphony No. 3, which came to life in the first few bars with such energy and finesse that it seemed there might not be anywhere else to go. But there was, and the five movements were splendid even if they were dragged out by incessant clapping from the first-timer/date-night-heavy Valentine’s Day weekend audience. After the break was Debussy’s Nocturnes, a piece favored by Esa-Pekka Salonen and given several worthwhile performances here in the not too distant past. And, while Frühbeck de Burgos's was a bit more full-bodied than the precision performances we’ve come to love, it was still to be savored. 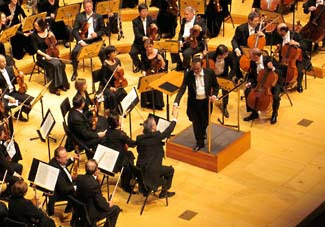 Finally, the orchestra returned for Ravel’s Daphnis and Chloe Suite No. 2, which burst open with color and brightness. This particular Ravel work has been highlighted frequently in L.A. in recent seasons including a typically overworked version under Dudamel, and I was thrilled to hear this snippet done so well. So while the audience may have been stacked with more than its usual share of young lovers, it was definitely a weekend where experience and wisdom won out. The Wooster Group is back in town at REDCAT for two weeks and, as usual, it is cause for excitement. Elizabeth LeCompte and her cast recently committed to an ongoing residency with the downtown CalArts venue that will include several works, both new and old, kicking off with North Atlantic, one of the group’s landmark pieces, which premiered in 1983, and has been revived several times since then. The Wooster Group has favored works that were adaptations of specific classics on their two prior L.A. visits, including a video-obsessed Hamlet and an outerspace spin on Cavalli’s opera La Didone. This current revival with its many references to the musicals of Rodgers and Hammerstein, is far more oblique in its attack, but every bit as funny and challenging. 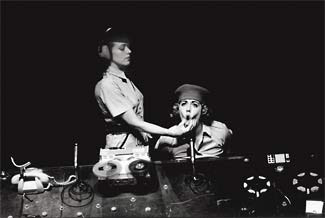 Although North Atlantic has taken several different forms and casts in its lifetime, the core elements remain the same – a sharp satire of American militarism and its association with gender issues, and in particular, the way these topics have been taken up by Hollywood and the media. But this brief description makes the work sound much more dry and straightforward than it is. It's actually more like South Pacific and Top Gun put in a blender with just enough methamphetamine to make things interesting. Things barrel right out of the gate with five male officers discussing their ongoing intelligence mission aboard an American vessel in a manner that is both highly idiosyncratic, rapid, and off-kilter. Soon they are joined by five female cast members who act as a sort of “ladies auxiliary” to the mission, spying by day and excitedly planning for the wet uniform contest to take place that evening. 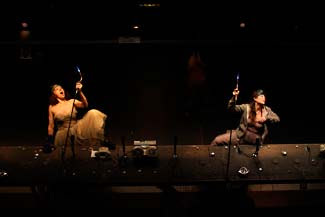 The women sit behind a long desk atop a steeply raked riser endlessly spinning reels of tape as they exchange a sort of manic dialog with the men around them. 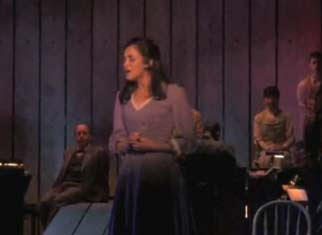 But let’s not forget this is a musical and soon the cast break into one of a variety of cowboy songs invoking Oklahoma! as much as the more obvious South Pacific. There’s an overlay soundtrack at times, too, involving loud explosions and other noise. And don’t worry, even Richard Wagner’s Liebestod fromTristan und Isolde is dragged into the mix. The combination is often very funny, although the effect can make the one-act 90-minute show drag along at times as well. The cast contains regulars such as Kate Valk, Ari Fliakos, Scott Shepherd and Koosil-ja Hwang, but Wednesday featured guest performances from Frances McDormand and an almost unrecognizable Maura Tierney (sans hair) as well. And while the group could clearly have used just a bit more rehearsal with the wordy and rapid exchanges, the performances overall were first rate with an arch and witty quality. Although written during the Cold War, North Atlantic has enough links to popular culture of the 20th century to still pack plenty of satirical punch. Just as American militarism never goes out of style, neither does the criticism of its down side. And while it might not be the ideal event for a valentine’s outing, North Atlantic should certainly be seen and is luckily running at REDCAT all the way through the 21st. Rest assured, while OWA has been out of commission over last weekend, I have not been hiding under a rock. I was actually out and about at several points over the weekend most notably attending the most recent L.A. Philharmonic performance under the direction of Herbert Blomstedt. He’s not flashy and has neither curly hair nor a twinkle in his eye, but he does know what he’s doing. He can take a program as uninspired as this one, which consisted of Haydn’s Symphony No. 101 and Beethoven’s 7th, and make it exciting. The Haydn was splendid and clear without too much fuss. The Beethoven meanwhile was thoroughly enjoyable if a bit overly rhythmic at the expense of broader lines in the score. But this is quibbling. It was a great, unassuming show without the need for big new ideas. Speaking of the tried and true, I also got over to the UCLA campus for Reprise’s closing performances of Carousel. The bare bones staging under Michael Michetti’s direction was decidedly meager looking. This isn’t a bad strategy, particularly in tough economic times, but if you go this route you’ve got to have performances that are better than good. And some of them were. Particularly Alexandra Silber as Julie Jordan, a role she has played to acclaim in London and elsewhere. She was both engaging and believable in a part highly reliant on outmoded cultural mores. Her singing was fantastic as well. The rest of the cast was good but often seemed cramped in the small area left for them at the front of the stage even without scenery or many props. Robert Patteri’s Billy Bigelow was a bit too pretty and worldly for my liking. It really wasn’t too much of a stretch to see why Julie might fall for him here. But in this day and age, Carousel is tough material to pull off with its ghost-story melodrama, and Michetti and Reprise should be congratulated for concocting something as coherent as this production. It certainly could have been a much less pleasant weekend. With such a high standard set, the rest of the evening was in danger of seeming pro forma. But it wasn’t and there were other surprises around the bend. Next up was Peter Maxwell Davies’ Eight Songs for a Mad King made famous in a recording by fellow composer Julius Eastman. Here, baritone Thomas Meglioranza embodied George III in the wildly dynamic screeching, hollering, and whispering that make up this score. It’s music that is alternately creepy and comical from the high pitch parody of Handel’s Messiah to his prowling about the stage, eventually smashing a (fake) violin relieved from one of the other performers. 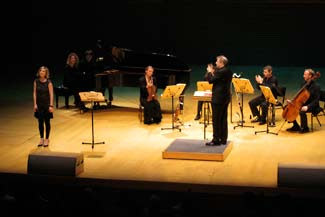 Davies wrote for an ensemble largely the same as Schoenberg’s Pierrot Lunaire and the similarities between the two works are multiple. Meglioranza had the nearly impossible task of sounding both totally unhinged and precisely musical and he did an admirable job of it. And while the entire performance may not have lived up to the standard set by Eastman, it was still a rather bracing one from the entire ensemble. After the break, a new ensemble returned with conductor Stefan Asbury and soprano Kiera Duffy for Schoenberg’s touchstone song cycle. In some ways the cards were stacked against it, in that by then, Pierrot almost sounded pedestrian and restrained given what preceded it. Duffy, who is featured in Susan Froemke’s film The Audition about the 2007 Metropolitan Opera National Council Auditions, gave a solid reading of the vocal part. I personally felt she was singing it a little too much as opposed to placing it in the Sprechstimme Schoenberg intended. The poetry is still beautiful, but sanity reigned more than anywhere else in the evening. I know it may be hard to believe that Schoenberg could be the sleepiest music on a program, but there it was. Which may speak more to how much things have changed in music since Pierrot Lunaire. Now madness has many faces and contemporary artists have found a new vocabulary to talk about these ideas building on Schoenberg's legacy. Except for the periodic stray rain shower, February is one of my favorite months in L.A. It’s freezing everywhere else, but here it's sunny, relatively warm, and you can see the days start to get longer. It’s also a great month for music around town with performances from a variety of esteemed guests. 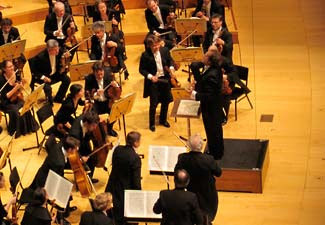 Perhaps one of the most exciting visitors at Walt Disney Concert Hall next month will be the Leipzig Gewandhaus Orchestra under Riccardo Chailly who'll appear on the 17th in an all-Beethoven program. Meanwhile, in the non-Beethoven department, Tafelmusik Baroque Orchestra returns on the 3rd and the Los Angeles Philharmonic will team up with Alarm Will Sound and Brooklyn’s own Dirty Projectors on the 27th. And perhpas most near and dear to my heart, Max Raabe and the Palast Orcheter will return for "A Night in Berlin" at UCLA's Royce Hall on the 18th. Speaking of the Los Angeles Philharmonic, they’ll be performing with three conductors who’ve proven they know how to marshal a great performance out of our wonderful orchestra on many memorable previous occasions. Herbert Blomstedt will lead a Haydn and Beethoven (again!) program over the weekend of the 6th. Rafael Frühbeck de Burgos will bring us Ravel and Schumann over the weekend of the 13th. 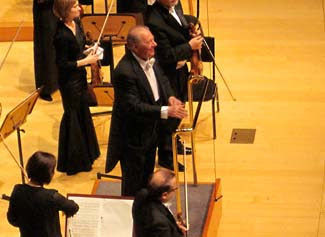 But don't miss, Charles Dutoit who will serve up more Ravel and Stravinsky’s Petrushka on the weekend of the 20th. And if you’re in the mood for more Petrushka, puppeteer extraordinaire Basil Twist will present his version of the famous ballet at the Broad stage starting on the 4th. If it’s newer music you’re looking for, the Monday Evening Concert Series will present an evening dedicated to Mauricio Kagel on the 22nd. The L.A. Philharmonic’s New Music Group will also offer a “Green Umbrella” program on the 2nd to include Schoenberg’s Pierrot lunaire with Kiera Duffy and a rare performance of Maxwell Davies' Eight Songs for a Mad King. On stage the big event will be the return of the Wooster Group to REDCAT as part of their ongoing residency at downtown’s most adventurous theatrical site. Elizabeth LeCompte and her troupe will revive North Atlantic starting on the 10th. 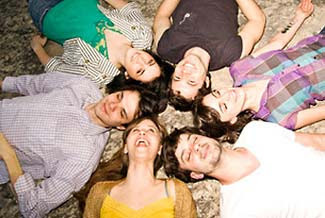 REDCAT will also welcome Chilean troupe Teatro En El Blanco with a work entitled Diciembre on the 24th. Far less experimental, but perhaps just as interesting will be the Mark Taper Forum’s new production of The Subject Was Roses starring Martin Sheen and Frances Conroy which kicks off on the 10th. And if you just can’t get enough of it, Dreamgirls will return again to the Ahmanson on the 24th. In the city’s great smaller theaters there are two particularly exciting offerings this month. The Blank Theater will open the local premiere of Christopher Durang’s comedy Why Torture is Wrong, and the People Who Love Them. The title says it all. But let’s not forget about the good news in theater coming from Pasadena: Boston Court Theater who will start their year of four world premiere’s with Luis Alfaro’s Oedipus El Rey on the 27th. It’s an at home month for me and the only out of town moment I’m going to get is also the month’s only new opera offering down in San Diego where the local company's markedly reduced 2010 season will premiere Verdi’s Nabucco with Richard Paul Fink on the 20th. That should about cover it until March. Sunday was a pretty good day for music. And while none of the proceedings at the Walt Disney Concert Hall benefited from Beyoncé or Lady Gaga, there was certainly more than enough excitement. First up in the afternoon was the concluding performance from the Los Angeles Philharmonic under Vasily Petrenko. The young, seemingly good-natured Russian led an appropriately Romantic Manfred Symphony with all the heartstrings intact. This is potboiler Tchaikovsky at his most long-winded and towards the end of the nearly hour-long work its normal for the mind to wonder. But Manfred is pretty much what you get here, and despite its ostentation, it was well played. Prior to this was the highlight of the afternoon. 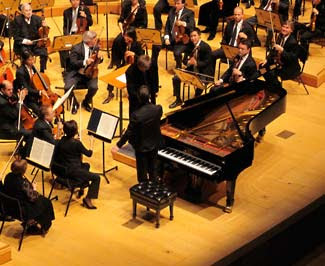 Beethoven’s First Piano Concerto with Piotr Anderszewski as soloist. Anderszewski is one of the most compelling pianists before the public today, and he turned out a performance of an old warhorse that was as fresh and alive as anything. With a fleet and surprisingly light touch, he carefully avoided overworking the first movement. The Largo was a cool, pristine burst of evening and amazing to hear. Anderszewski had also wowed the audiences downtown earlier in the week in a performance of Shostakovich’s Piano Quintet along with members of the LA Philharmonic. Drenched in grief, the chamber piece had much more lyricism than one might expect from the Russian master known for his ability to turn rapidly between dirge and military drive. On both occasions it was just lovely, lovely playing. 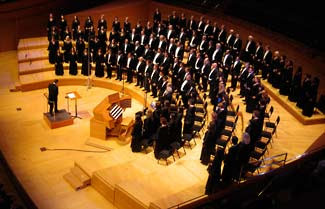 Later on Sunday, the WDCH was occupied by Grant Gershon and the Los Angeles Master Chorale doing a program of largely a cappella 20th century sacred music including two settings of the Mass. Each half of the program featured a work with organ accompaniment followed by a larger a cappella composition. Even though it was all 20th-century material, there was a split between works from the living, like Nico Muhly, and those of the deceased, Frank Martin and Jean-Yves Daniel-Lesur. The program opened with Muhly's Bright Mass with Canons featuring a rather Messiaenic organ part that tinkled along busily often in opposition to the chorale music. Gershon told us about Muhly’s being a hot, young talent and while I’m not convinced of the latter from any of his music I’ve heard so far, I would say that in the words of Meatloaf two out of three ain’t bad. Messiaen hung over the more substantial music on the program as well as in Daniel-Lesur's Le cantique des cantiques,a twelve-part a cappella work plumbing topics simultaneously spiritual and sensual that Daniel-Lesur's contemporary was no stranger to. It was magnificent with perhaps the most deeply felt sentiments in an evening filled with proclamations of faith. It was well paired with Frank Martin's Mass for a Double Choir that provided a beautiful and contemporary setting of the Mass. It's a shame that Martin's work isn't better known in this country, and I'm thankful to Gershon and the excellent musicians of the Chorale for sharing these two particular wonders with us.